Whenever I’m in a creativity funk, I head into my garage or Craft Room to do some tidying up and rearranging when this happens. Why? Because I usually unearth something long forgotten and it’s the shot in the arm that I need to get back in the proverbial (crafting) saddle! And that’s how I decided to upcycle an old window frame into cottage style decor with a Spring twist, using doilies and embroidery on screen mesh. Believe it or not, but I’ve had this window frame since before I started my blog! 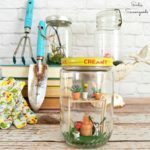 Old, rusty, and crusty, it’s the perfect project-to-be…just needs a clean-up and a jazzing-up to become something whimsical and fun for Spring! This post contains affiliate links for your crafting convenience. Now…as much as I love a little rust and crust, this guy was a little overwhelming. The mesh screen on the back was old and, well, menacing- because it grabbed, snagged, and sliced anything that came near it! So, I decided to give the whole thing a makeover…without really changing its appearance. Kind of like very natural cosmetics. The malevolent screen mesh had to go! So, with tools in hand, I carefully removed it and the crumbling staples that held it in place. The wire brush came in handy for really scrubbing the back of the window frame, which cleaned it up nicely. Now to freshen up the front of the window frame – I had virtually the same color craft paint leftover from this project! So, I dry brushed some on the frame just to brighten and liven it up. I wanted it to remain that dusty shade of green, since I planned to create cottage style decor for Spring. We already had some inexpensive window screen / screen mesh on hand. I cut out a rectangle just smaller than the frame and spray painted the screen white. A cheap clip hanger works perfectly for spray painting screen! Then, I just attached the screen to the back of the frame! So, now it’s fresh and clean and ready for next steps- but you might be wondering just what my plan is. Well…basically…I’m marrying two of my favorite projects: My Doily Display…and my Doily Table Runner! Springtime makes me think of cottage style decor, so that’s what I decided to create. From my collection of small and tiny doilies, I selected a few and placed them on the screen in a layout that I found pleasing. Then, I dyed them in various Springtime shades of pink, yellow, and aqua (which are all very cottage style decor colors, as well). After I had ironed them flat, I pinned them on the screen in the original layout and got ready to stitch them in place with coordinating thread. Don’t they look like little happy flowers or cottage flowers? For a bit more whimsy, I grabbed some sage green embroidery floss to add some vines and leaves between my doily “flowers”. My hope was that the embroidery would fill in the open space a bit and just give it another pop of pale green. Final result? 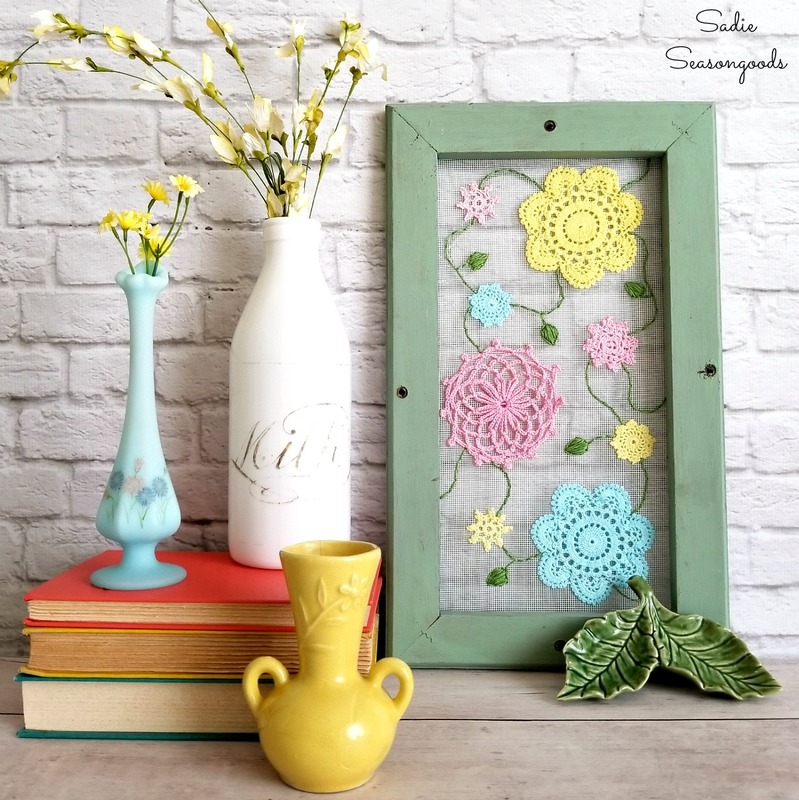 A pretty floral window frame that is perfect for cottage style decor / Spring home decor. The doilies represent happy flowers and the embroidery adds movement and whimsy. Exactly what I needed to rev up my creative engine! It just makes me smile! But cottage style decor does that- with its pretty colors and happy flowers. And it reminds me that I should tidy up my garage (and get inspired) more often. 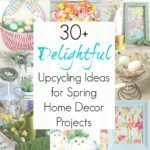 Looking for additional upcycling ideas for Spring home decor? Please check out my full collection here for even more inspiration! This is why I follow your blog. You took something so random and made it so interesting and pretty. Such creativity. Thanks! Perfect! I have an old ugly screen that I have wanted to lighten up for awhile. Thanks for the inspiration!! You are so very welcome, Sue! Loved this, its very cute. Also inspired me to get my crafting organized as well I need inspiration. Checked out the Etsy Shop too, WOW tons of fun stuff. Thank you for sharing this wonderful idea. Girl, even in your so called dry spells you come up with the best ideas – love this! Thanks for the tutorial! I have a black frame and screen that I want to stitch with a tree of life pattern. What would be a good weather proof ‘thread’ to use? Thanks, Mary! Unfortunately, I don’t know- I’ve never needed an outdoor or all-weather thread…hmmm…I’m sure that there are synthetics out there that are colorfast. What a cute idea! I never would have thought of something like that. Now I need to find an old screen! LOVE this project! So pretty and perfect for spring. That is so pretty. Thanks for the instructions. Love love love love love!!!!!!! Very pretty piece of artwork. I like how you showed step-by-step the process and how you put together the old frame, doilies, and new embroidery to create the piece. So creative! I’m truly shaking my head slowly from side to side, in the best way, just smilin’. SO. BEAUTIFUL. That is all. Muah!!! Thank you so, so much! This is so pretty and yes very spring like. That is very cute and creative! Sure looks like Spring! Am so doggoned glad I clicked on your post in link party. This is such a great and lovely project. Will be out scrounging in my frame box tomorrow and seeing if we have some screening to be used for it. Also digging in my doily collection. My decorating is quite cottagey, suits our little singe wide mfg. home well. Good thing it’s not bigger, already have too much stuff stuck out in shed and other places. Love this incredible Springy project, gets my creative juices flowing which have needed for while. Am working on coming out of grief over losing our 22 yr.old grandson and after having shoulder replacement surgery/physical therapy, been long enuf, now it’s time to get with it, miss making things to refresh our little house. Have been inspired by you several times before, have gotten me going again with your wonderful projects..
Love that what your projects are, are doable and affordable and so inspiring. Well, have frame ready to paint, bugging hubs to get screening out, only thing left to do is clear a path to my doily box. that’s hardest part, lol. Can hardly wait to get started. been working on figuring out what I want for new art, like to change out in Spring/Summer especially. Usually make my own from printables so generously shared by bloggers and Graphics Fairy. Go thru lots of ink but enjoy making own rather than buying. Paying for ink cartridges is my one luxury. When people share their homes I like to see what art they have and how they display, then make what appeals to me. Have lots of thrift store frames plus frames we make with lathing strips and few other ideas. To me that’s half the fun and challenge. When our daughter comes over she walks around looking for new art have made. What a beautiful project! Love it. Pinning. Love it, so cute and perfect for spring! Visiting from Inspiration Monday party. Oh I’m so glad you’re out of your crafty downer Sarah. We can’t have that at all, where would we find our inspiration 😉 Your doiley work of art is beautiful and super creative. Love it!! Thank you!! I’m always worried that the ideas will just…stop. YIKES! Just charming. The way you created the vine sets it off nicely. Thanks for sharing! Beautiful vignette – wish I had an old screen! Doily art is one my favorite crafts. This is darling Sarah! I love how you painted the doilies to add some spring color! 🙂 Have a great rest of your week! I have a couple of folding screens that this would be beautiful on. Probably I’ll just do one and if I love it as much as I expect to, I’ll be back to ask if I can make one to sell! You have such a fresh and whimsical outlook! <3! It makes me smile too. It also reminds me that I should go through my stashes and see what treasures I’ve been overlooking. Thank you for sharing with us this week at Celebrate Your Story, and I hope your week is going great. Thank you so very much, Sandra! Adorable project. Thank you for sharing at Vintage Charm. WOw, what a transformation, it’s so pretty! I love everything about this project! I love doilies, but want to use them in fresh, new ways and sewing them to a screen is definitely that! I’ve got a few crusty, old little screens hanging around too and replacing the scary screen is a great idea. Kudos! Love your style! Thank you so very much, Lora!! Ya gotta love “Pure Whimsey” . . . I just love this project! You are so creative! I always purchase doileys when I am visiting antique shops and I can’t wait to go through my stash to begin assembling choices for this project. Thanks for sharing. oh, so sweet and springy looking! I love this! Your doily/embroidery craft looks just like a garden of spring flowers welcoming the sun and the birds. I just love it. You have done a wonderful job upcycling the screen and frame for a doily garden. Love your screen with the doily flowers. Omgosh! I am out the door looking for a small old window and doiles! This made me smile, so cute and clever! Thank you so much, Scotty! WOWOWOWOWOW, well you just made my day! I really do appreciate that, Susan, wish I could hug you in real life right now!